Texas Gov. Rick Perry announced today that he will not seek reelection. The time has come to pass on the mantle of leadership,” he said at a rally in San Antonio. “Today, I’m announcing I will not seek reelection as governor of Texas.” Perry has served as governor since 2000, when then-Gov. George W. Bush (R) became president. 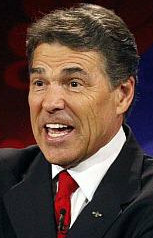 Perry was elected to full terms in 2002, 2006 and 2010. Perry also alluded to a potential 2016 presidential run, saying he will “pray and reflect and work to determine my own future path.” Since his 2012 presidential bid floundered – capped off by his “oops” moment at a presidential debate — Perry has eyed a second run. The main contender to succeed Perry is virulently anti-gay Texas Attorney General Greg Abbott, who declared in April that any Texas municipality that offers domestic partners insurance to its employees is in violation of the state constitution. The city of Austin and Travis County have not moved to rescind those benefits.